BGO Casino offer up to 50 Fair Spins - No Wagering Requirements! BGO Casino has just removed all the wagering requirements from their welcome bonus offer! New customers will get up to 50 Fair Spins on 1st deposit, 1 free spin for every £1 deposited! Maximum win is not capped anymore, you don't have to wager winnings anymore as they are paid in withdrawable cash! Make your first deposit of £10 or more, and receive 1 fair spin for every £1 deposited, up to 50 free spins! You can use your spins to play some of the most popular games: Starburst, Fairytale Legends: Hansel & Gretel, The Legend of Shangri-La: Cluster Pays, Aloha! Cluster Pays. * Winnings paid as real cash. 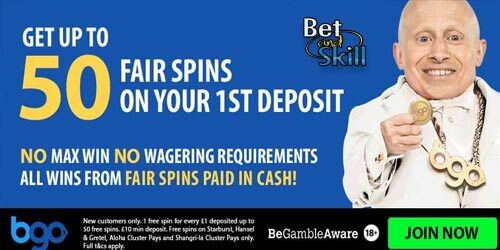 What are BGO Fair Spins? Fair Spins basically are Free Spins with no wagering requirements. There's no maximum win (like in the "old" free spins offers) and all winnings are paid in cash! Bgo Entertainment is a privately owned online casino company operating in the regulated UK market. Started in 2011, the company has won awards for its marketing relating to campaigns featuring big US celebrities such as Paris Hilton, Dan Blizerian and Verne Troyer. BGO’s use of multiple software providers - Bally Technologies, Barcrest, Endemol Games, Eyecon, IGT / Wagerworks, NetEnt, NextGen Gaming, Playtech, Quickspin, WMS - results in an excellent range of gambling products, all of which can be played via a dedicated mobile service. "BGO Casino offer up to 50 Fair Spins - No Wagering Requirements!"